Ancient China had a government ruled by dynasties, sometimes united under one dynasty but often competing dynasties in controlling different regions. Ancient china’s resources, large areas and large populations demanded a strong central government. When one of these regional dynasties became dominant their king would become the emperor. The government these dynasties created tended to be very autocratic and even despotic, ruthlessly enforcing their rule and conscripting massive armies and labor forces. Perhaps this was a necessary evil considering the threat of barbarian invasion, potential internal rivals and massive rebellions. Confucianism was developed in ancient china, a philosophy stressing virtue, good governance and merit based promotion for government offices. Emperors and officials were to be virtues and effective, models for their subjects. However, even when practicing an enlightened confusion form of government, a virtues example for the people, the ancient Chinese dynasties tended to be bureaucratic and very strict. Warlord kings ruled different states in the begging, always attempting to dominate the rival states and dynasties around them. The governments were monarchies, lead by the patriarch of a ruling dynasty, and warfare was endemic. The heads of the dynasties believed they had a “mandate of heaven” to rule their people if they ruled well. This mandate was given to them by their pagan celestial gods. It was given to dynastic rulers who had success, but those dynasties that lost wars or were plagued by natural disasters would loss the mandate and be overthrown and replaced by a new dynasty. The governments were absolute; they even sacrificed people at funerals and other rituals in honor of ancestral kings. Servants, concubines and men at arms were sacrificed at royal funerals, at times numbering in the hundreds. Over the centuries, from 2100 BC to 220 BC, the dynasties were able to control more territory. 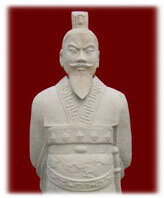 China was eventually united under one of the regional kings, the first emperor Qin Shi Huang, in 221 BC. During the Qin Dynasty he founded only lasted for 12 years but the emperor wielded absolute power over all of China. The emperor was despotic, ordering the burning of books to remove all evidence of any earlier dynasties and burying many scholars alive by ceiling them in a room. His tight control of China allowed him to conscript massive labor forces, allowing him to construct ambitious projects like the Great Wall of China. The workers died by the thousands in harsh conditions, but the nomadic tribes they protected the population from where skilled horse archers and ruthless invaders. These nomads also killed thousands of Chinese soldiers in massive bloody battles, the Qin generals using massed levies like pawns. 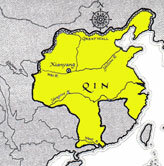 The Qin Dynasty had gained control over the mass of peasants by abolishing the landowning lords who they had formerly served. The abolishing also agricultural output and allowed for larger military forces. The Qin also standardized weights and measures, and even standardized axel lengths for carts to ensure their roads were the right width. This increased all had the effect of increasing trade. The Han Dynasty that followed the Qin ruled over a golden age in Chinese history. There aggressive policy towards the “barbarian” nomads greatly expanded their frontiers in all directions. They had used the nomads mounted strategies against them, pushing into central Asia and making contact with the Persians. This connected the Roman, Persian and Chinese trade routes, creating the great Silk Road. China’s traders and government prospered from the government held monopoly on silk. Secrets of silk making were protected by law and breaching a law would mean canning or death. The following dynasties created a feudal system but continued to be autocratic monarchies. Civil wars also fractured China into different kingdoms periodically throughout the 2200 years of dynastic rule. Eventually, the nomadic tribes got the upper hand in the endless struggle between them and China and they created Dynasties of their own. These new “barbarian” rulers, like the Wu Hu, Mongols and Manchu, began to take up Chinese customs like wearing silk robes instead of their horseman’s pants. They modeled their rule after the Chinese and were soon swallowed into Chinese culture becoming just another Chinese dynastic government. Eventually, Chinese military fell behind in the development of firearms and ruling dynasties lost much of its influence and control. In 1911 the last dynasty was overthrown. Thousands of years of dynastic government had ended, China would now be known as the Democratic Republic of China, but heavy handed rule persists throughout the modern Chinese state as in the ancient eras.